This printable DIY Valentine for kids is a great way to foster creative expression, strengthen fine motor skills and even attention. Besides, giving from the “heart” is fun! 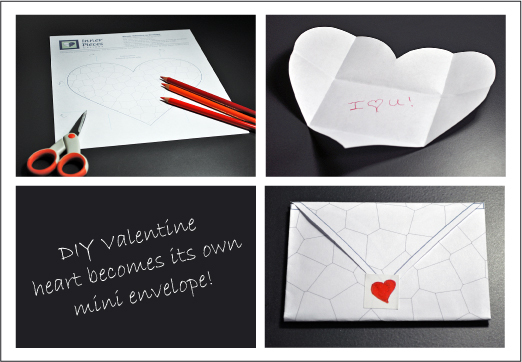 Children will enjoy transforming their cut and color mosaic heart into its own mini envelope. If you’ve been a loyal subscriber for more than a year (thank you thank you) then you’ve seen this Valentine’s Day printable before. This year it makes its debut on the Inner Pieces Gallery blog as an extra bonus for newcomers. Don’t worry, your regularly scheduled (new) monthly printable arrives soon! Not a subscriber yet? For access to this printable and more simply add your name and email to the sign up box below. • One black and white mosaic heart to cut, color, and fold into its own mini envelope (instructions and folding guides included). • One colored-for-you mosaic heart, just in case you have way too many Valentines this year and couldn’t possibly color them all. • Standard printer paper or thin card stock works best for ease of folding. • Write a personal message or draw a picture inside your heart / mini envelope. • The envelope may be small but is still the perfect size to fill with a treat. • Seal your envelope with a sticker, glue-dots or tape. Then watch your recipient light up when you deliver your made-by-you Valentine. Note: The latest version of Acrobat Reader is required. As always, please assist children who are not yet ready for scissors. And while you’re at it, print one out for yourself. Remember, there’s no age limit on fun! Happy Valentine’s Day from Inner Pieces Gallery!